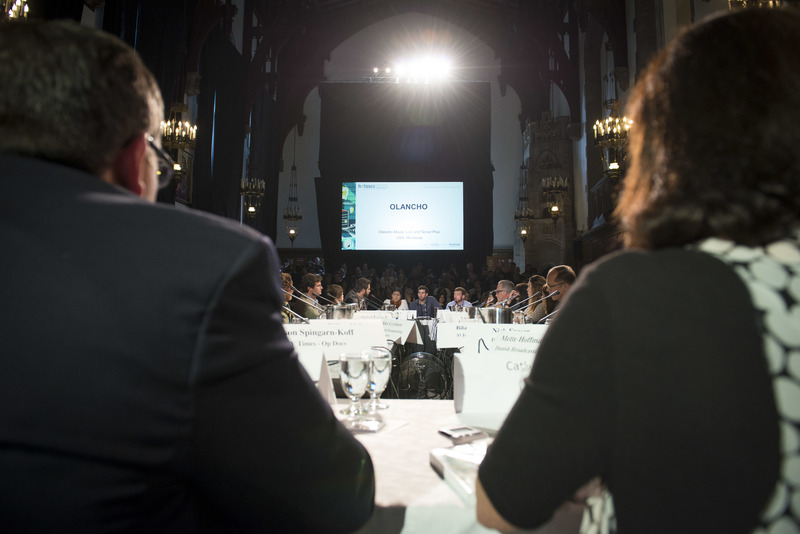 This year is the 20th edition of the Hot Docs Forum, a renowned financing event aimed at securing international co-productions and funds for feature-length documentaries. The Hot Docs Forum is the flagship industry event of the Hot Docs conference and market and could be the launch pad for your next documentary. One of our goals at Hot Docs is to unite our documentary community—the international filmmakers and industry that make up our special ecosystem. We believe in facilitating opportunities for you to exchange ideas and that your individual skills as storytellers will spark amazing international co-productions, strong partnerships, and beautiful cinema. Our commitment to documentary filmmaking is manifested in over $135,000 in cash prizes, raised by Hot Docs, that is awarded to pitches each year and the millions of dollars of deals that have happened at the Forum table and in meetings. We believe your stories will travel and reflect back to audiences' the real-world experiences they are hungry to discover. We are grateful to be part of your documentary journey. The impact of pitching can be huge and cause ripple effects throughout a filmmakers’ career. Documentary is a business of relationships, and pitching events are essential networking and marketing opportunities. Pitching forums and other forms of public crowdfunding offer direct financing, access to the market, networking opportunities, and education in documentary financing and production. For observers, public pitches are an education on film funding, storytelling, teamwork, and the how the international documentary community unites and functions. The insights shared in the room give observers a better sense of the film landscape, funders' needs, and how projects come together. By attending public financing events, observers can study how stories are presented and learn to improve their own pitching skills. 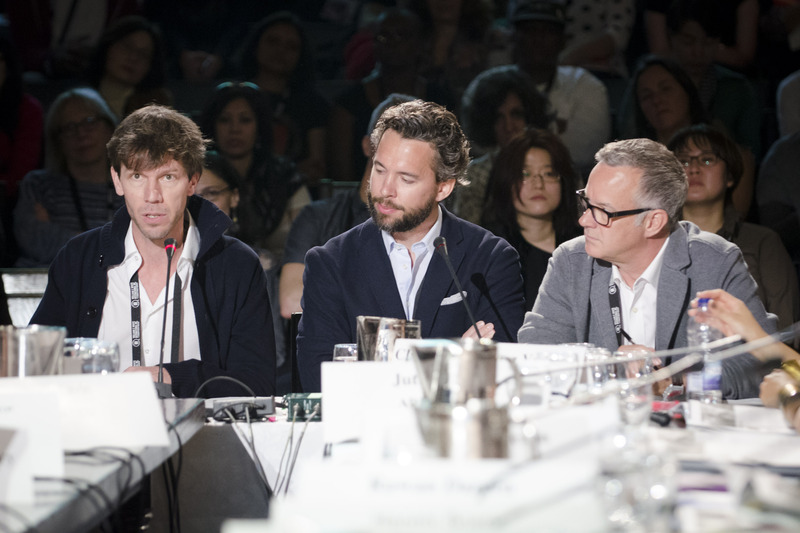 Hot Docs fosters direct investment of documentaries at the Forum. Our first look program lets philanthropic minds from the documentary community lend their support to filmmakers by investing in their projects. We guarantee that teams come out of the Forum with more skills and connections, as well as the opportunity to secure financing deals for their projects. In addition to the chance of being financed, the market validation accrued at the Forum table is significant. Many teams profit from access to the players in the global documentary market, creating working relationships with decision makers for future films. The Hot Docs Forum provides a window into the trends and tastes of the ever-changing marketplace. In it, we witness how deals are being made and how the rules are shifting in this new digital age. At the same time, it is an opportunity for us to come together and share our stories. The people you will connect with will inspire you and become your international cheerleaders throughout your career. The premise of the Forum is simple: During two consecutive mornings (April 30 and May 1, 2019), 20 teams have seven minutes to pitch their projects to a table of the world's leading commissioning editors, financiers, and industry professionals. Following the pitch, each team receives eight minutes of moderated feedback and, in some cases, on-the-spot financial commitments. Following this, the teams move to one-on-one meetings (held over three afternoons, April 30 - May 2) with various decision makers. The teams are eligible for pitch prizes: the Hot Docs first look prize, which awarded $125,000 across three projects in 2018; the $10,000 Hot Docs-Corus Pitch Prize for the best Canadian pitch; and the Cuban Hat Prize (ranging between $3000-$5000 plus services). See here for more details. Last year's 11-day festival screened 263 films and DocX projects, including 61 world premieres, to audiences of more than 230,000. The Festival also awarded over $272,000 in cash and prizes—$137,000 of which was awarded during the Forum. The industry conference and market welcomed a more than 2,650 international delegates, who participated in a roster of six interactive workshops, three Kickstart panels, 20 conference sessions, 19 networking events, five Micro-Meetings, 18 Close Up With... sessions, the annual Doc Summit, international co-production events, and the Hot Docs Awards presentation. "An extraordinary marketing opportunity and chance for you to create buzz not only about your current project, ‎but buzz about yourself as a filmmaker... I can't begin to tell you the number of times that a project that left me cold when I read the treatment, surprised me and ended up being the one I invested in after I saw it pitched publicly." "The Forum gives filmmakers a unique opportunity to present their work not only to a panel of experts sitting formally around the decision makers table, but also to their peers, funders, and supporters in the room. It builds a network of support for each project. To be selected to pitch at Hot Docs helps filmmakers sharpen the focus of their film and it validates that this is a project of significance that you must pay attention to." "As someone who has sat at that long Forum table—both as film director who is pitching and as a broadcaster/funder who is listening to other filmmakers pitch—I cannot say enough about the tremendous opportunity the Hot Docs Forum presents to figure out how to make people excited about you and the story you’re trying to tell. The energy in the room is incredible and two hundred onlookers will focus the mind." Dawn Porter, who pitched in 2011 adds: "There's really nothing like the experience of presenting at the Hot Docs Forum. All the commissioners you are chasing and trying to get five minutes with are all focused on your project—at least for a critical seven minutes! It’s terrifying but fun." Dana Nachman, producer of Case 993, who won the $75,000 first look prize in 2018 reflected: "When working on a film one can often feel alone and isolated in the years it takes to get a film made and out into the world. Our coming out party at Hot Docs Forum 2018 gave us a huge shot in the arm for the project and opened the doors to dozens of people and organizations who are now interested in the film and tracking it, so thanks to Hot Docs for this amazing opportunity! The Forum was one of the best experiences I have had in my filmmaking career!" There are other factors outside of networking and publicity to be considered. Jason Ishikawa, head of International Sales at Cinetic, notes: "Foreign pre-buys and/or co-productions can help spur increased domestic funding, which is something every project should look into." Ryan Harrington, former director of Docs & Specials at Discovery Channel, adds that filmmakers having a commissioning editor who, "really speaks that language of financing and production can be helpful in presenting the project to other editors and broadcasters." In terms of the financial benefits, Paula Eiselt, director of 93Queen and recipient of the inaugural first look prize in 2017 stated: "The Hot Docs Forum was one of the most exceptional experiences we had while birthing the film! To have the opportunity to share—and essentially test—the story with international discussion makers while we were still in progress was a tremendous, and deeply impactful, privilege. The Forum was the perfect way to connect with buyers—both before and after our pitch—and not only were the meetings terrific, but since Hot Docs they have borne real fruit!!" Producer Jessica Devaney, who pitched alongside director Assia Boundaoui in 2017, noted: "We raised $233,000 USD in grants, all from organizations we met with at Hot Docs. Pitching in the Forum raised the profile of our film and helped us make the most of the table meetings." While we love international projects, please do keep in mind that not all projects are suited for a big public debut. Consider the timing, topics, and production schedule of your film. Before applying, ask yourself: What are my goals for this project? What kind of partnerships and/or financing am I seeking? Am I prepared to present my film to a room full of industry decision makers? Is this the best time? Am I ready to commit to outside partnerships? "We were very tense before we pitched. As one of the first Kenyan teams to do so, we wondered what the reception would be like. It was an epic experience. Participating in the Hot Docs Forum opened up a lot of doors that, as African filmmakers, we thought were impossible to open. This included a co-production with one of the largest public broadcasters in the world, a first for a Kenyan feature documentary. Multiple-award-winning production company EyeSteelFilm have come on board and we have also secured over $150,000 USD in funding (and counting!) thanks to the supportive and safe space given to share our project. The greatest thing though was the love we got from the global film community at the Hot Docs Forum. Winning the audience award affirmed that our local story about active citizenship does have a global audience, and that has been an incredible moral booster for the entire team. Our fear has turned to great optimism and we would encourage more African projects to give it a shot." Samba Gadjigo and Jason Silverman's Sembene! 1. The filmmakers have access to a unique subject and/or protagonist. They have delineated clear and creative storytelling that is compelling to a wide array of international decision makers and viewers. 2. The team works as a unit and gives the audience confidence in their partnership. They are prepared to speak to their roles, know what they are looking for, have a solid knowledge of the players in the room, and are ready to answer questions about a variety of relevant topics including the validity of the budget, the access to protagonists and stories, and the feasibility of delivering the film according to the projected timeline. 3. The team clearly delineates what will be shown on screen, avoiding jargon and metaphor. They are able to speak to the unique value of the film and understand how it fits into the documentary landscape. 4. If seeking broadcaster support, teams are prepared to speak to both a feature length version and a 52-minute (or TV length) version of the film, the latter of which may be a requirement from a broadcast partner. 5. The pitch is matched with compelling visual materials that give decision makers a taste of the filmmaking and an understanding of the topic and/or subjects. 6. The team follows up on feedback they receive around the table following their pitch. In today's shifting market, cheques are no longer written on the spot and in many ways the hard work starts after you pitch. Forum submissions open November 1, with a final deadline of January 7, 2019. Check out our Submission Guidelines & Form to apply. If you decide pitching at the Hot Docs Forum isn’t right for you, we offer a wide range of industry programs designed to help you network, finance, and find distribution for your projects. Hot Docs Deal Maker offers opportunities for financing through one-to-one pre-arranged meetings with international commissioning editors and film funds. Welcoming titles across all documentary genres, this program is ideal for commercial projects and broadcast appropriate one-offs and series. If your film is in the final stages, we encourage you to apply to Distribution Rendezvous, our one-to-one pre-arranged meetings with a slate of international sales agents and distributors seeking rough cut or market ready films. Submissions for Hot Docs Deal Maker and Distribution Rendezvous open January 17, 2019. Dorota Lech is an industry programmer and the producer of the Hot Docs Forum. She also works at the Toronto International Film Festival in the Programming department. You can find her on twitter @dorotamischka. With over 175 contacts and vital information about the international broadcast and digital players, the Hot Docs Guide to Decision Makers is an invaluable resource for any producer. Find our 2018 guide on sale here.